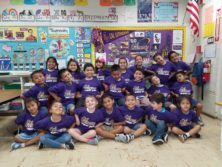 EAST WHITTIER – Ceres Elementary School kindergartners participating in a college mentoring program have discovered a love for purple and gold, the colors of Cal Lutheran University (CLU). 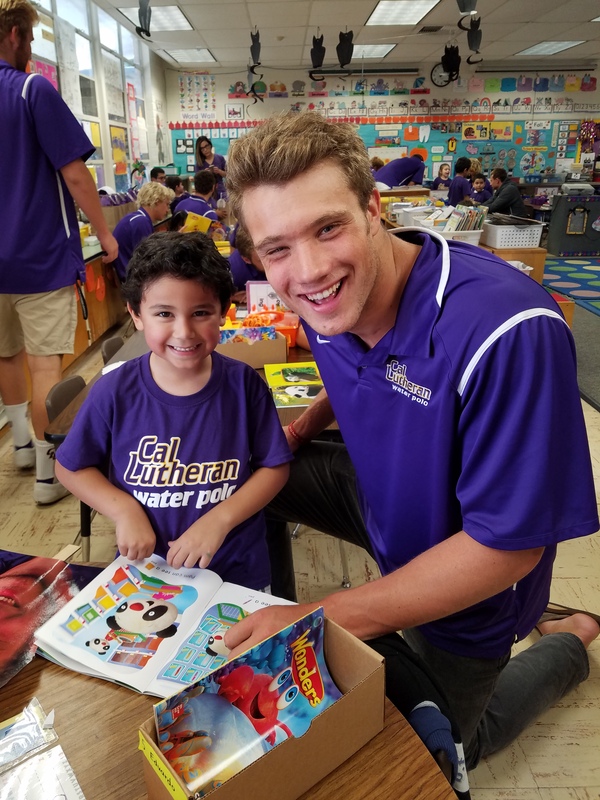 For the last three years, members of the CLU men’s and women’s water polo teams have made regular visits to Ceres to encourage students in Catherine Loomis’ kindergarten class to begin thinking about attending college. In return, Loomis’ students have made numerous trips to the Thousand Oaks university to watch the water polo teams compete, gaining their first taste of college life. On April 19, the entire class will take a field trip to CLU for an all-day campus tour. In 2013, Ceres applied to become a member of No Excuses University, a network of schools that ensure students are exposed to college and university options. Ceres Principal Julie Gonzalez challenged her faculty to create programs that would help instill a college-going culture on campus. Loomis reached out to Cal Lutheran water polo coach Craig Rond, who immediately committed his athletes to become mentors for her students. Loomis and her class first met their CLU mentors after a water polo match at Whittier College. The Cal Lutheran mentoring program includes periodic campus visits by small groups of CLU athletes to read to students and participate in physical education activities. Throughout the school year CLU mentors send letters of encouragement to the students, who respond by writing letters in return. The CLU mentoring program has expanded to include other Cal Lutheran athletic teams, as well as members of the CLU Office of University Relations, who send care packages of pencils, erasers, school stickers and seasonal coloring books to the kindergartners. Loomis’ students CLU pride is on full display during College Tuesdays at Ceres, when students wear the purple and gold of Cal Lutheran. The mentoring program has had a profound reciprocal impact on the lives of the CLU mentors as well. The CLU mentoring program has proven so successful that other classes have adopted their own colleges – UCLA, Biola University, Whittier College and Concordia University among them – as Ceres seeks to have students familiarize themselves with six different colleges by the time they leave elementary school. Ceres officially joined the No Excuses University network in 2016. 041317_CERES_CLU_MENTORS1: Ceres Elementary School kindergartners in Catherine Loomis’ class proudly show off the purple and gold of Cal Lutheran University on the school’s College Tuesday. 041317_CERES_CLU_MENTORS2: Cal Lutheran student-athlete Taggart Diehl reads to Ceres Elementary School kindergartner Eduardo Chimal during a classroom visit. 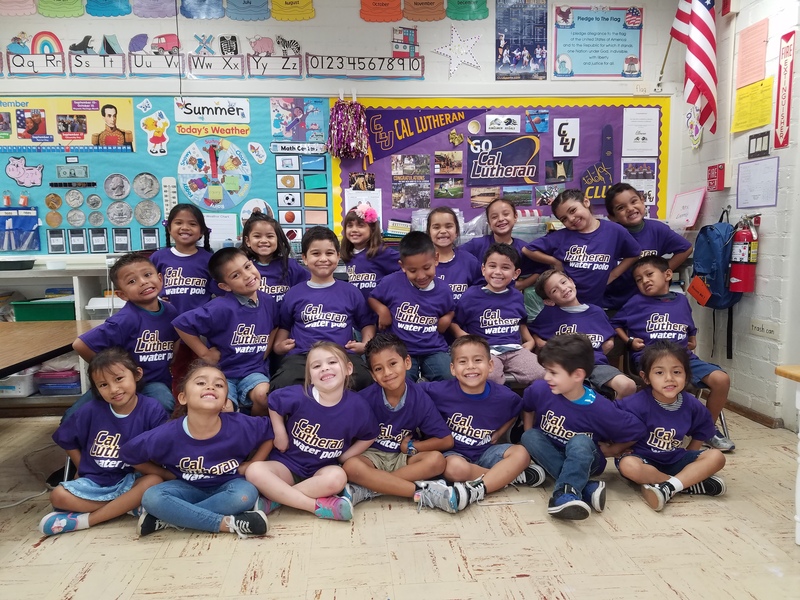 Ceres Elementary School kindergartners in Catherine Loomis’ class proudly show off the purple and gold of Cal Lutheran University on the school’s College Tuesday. Cal Lutheran student-athlete Taggart Diehl reads to Ceres Elementary School kindergartner Eduardo Chimal during a classroom visit.